marking a swift turnaround in fortunes following recent troubles. 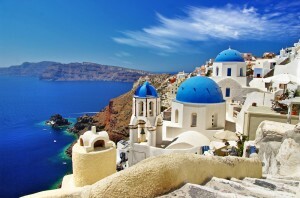 Tour operators have seen a sharp jump i bookings for the Greek islands as tighter capacity in Spain forces sunseekers to consider affordable alternatives. While the popularity of Greece’s picturesque beaches and tavernas has never been in doubt, recent economic difficulties and the huge influx of migrants from the Middle East have put off many tourists from visiting. Now the country’s travel industry is hopeful that the worst is over, buoyed by a projected 27 million arrivals and 9% rise in tourism revenues in 2017. TUI and Thomas Cook have both highlighted Greece as one of their success stories for this summer, alongside Cyprus, Bulgaria, Portugal and Croatia. Thomas Cook said it expects to take 2.5 million tourists to Greece, a rise of 500,000 on a year earlier and making it the summer’s ‘stand-out’ destination. Firms have increased capacity in Greece after hoteliers in Spain reportedly upped prices by as much as 8% to cope with demand caused by holidaymakers switching from Turkey and Egypt in the wake of terrorist attacks. In contrast, prices in Greece have remained largely static as the tourist industry continues to focus on wooing back custom. The weaker pound means UK tourists will be attracted to destinations where their budgets will go further. Greece relies on tourism for around 18% of its GDP and is responsible for creating one out of every five jobs. This means that anticipated revenues of 14.5 billion euros (£12.4 billion) from tourism in 2017 will be vital for an economy still on life support, having received its first bail-out from the European Union and IMF in 2010. But as the economic and political instability shows no signs of ending, there are still many clouds on the horizon to offset this summer’s tourism boost.